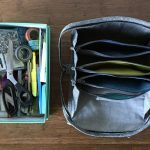 A few years ago, two sewing kit bag patterns were making the rounds online—the Bionic Gear Bag and the Sew Together Bag. While I wanted to make one (either one), I never managed to prioritize it amongst other projects. 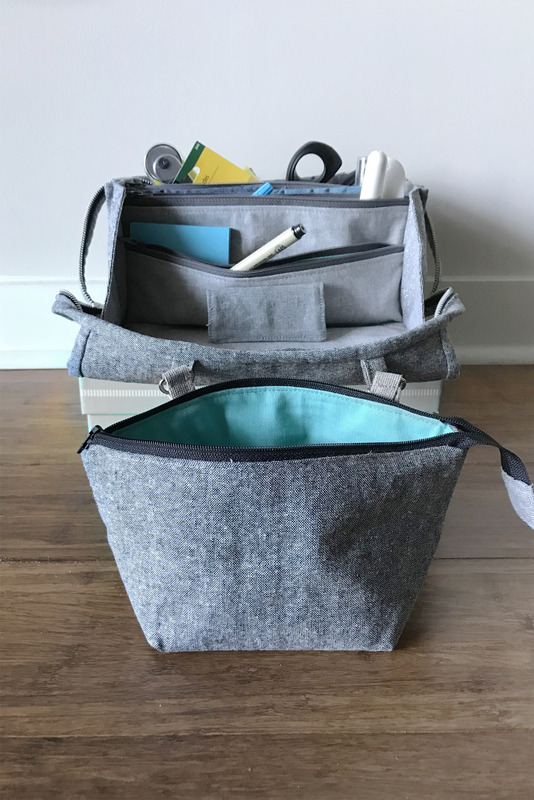 Events this year have sparked that desire again, and when I found myself tossing all of my tools and notions into a cardboard box to tote down to GA, making one quickly jumped toward the top of my project list. 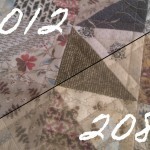 First, a confession: I hate buying patterns for quilts and bags. If I’m going to pay for something, I want to learn something, and so many patterns don’t introduce any new ideas or skills. In other words, I can do addition and geometry; teach me the out-of-the-box, or simpler, or more couture, or more resilient way of making the thing. 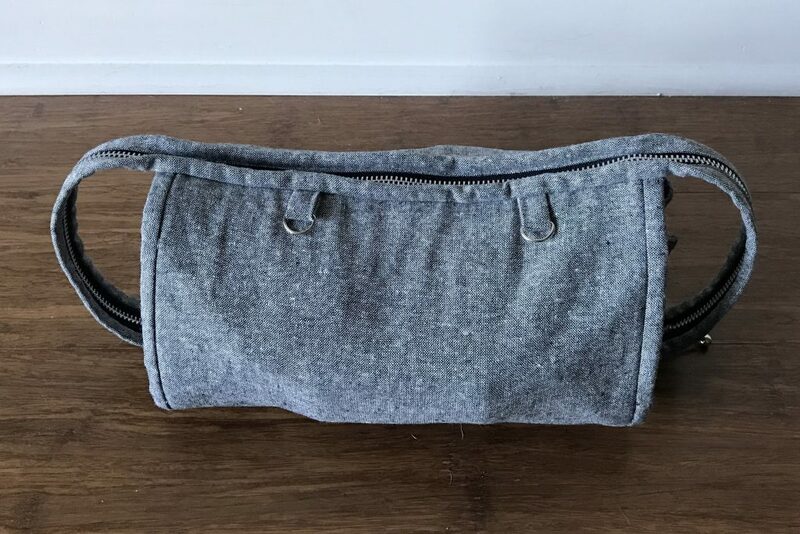 If not for the fact that I’ve never made a bag with interior divider pocket/zips like this, I would never have used this pattern. It was so chatty, unpolished, poorly photographed, and needlessly long. So, caveat emptor if, like me, you’re a bit behind the bandwagon on this. I chose the Bionic Gear Bag over the other for two reasons. First, I was able to see the product in person; three fellow guild members brought theirs to our spring retreat. Second, I like that the front becomes a tray when open, which gave me a place to modify the pattern with d-rings to hook a thread catcher bag onto (another long-term non-prioritized want). I don’t have any criticisms of the final product the pattern produces, just the pattern itself. I did very little in the way of modifications. I chose to leave off the snaps and not make the fabric dish (another 36 pages of instructions!). I added a needle minder to the front pocket (made from a couple of batting scraps and fabric). 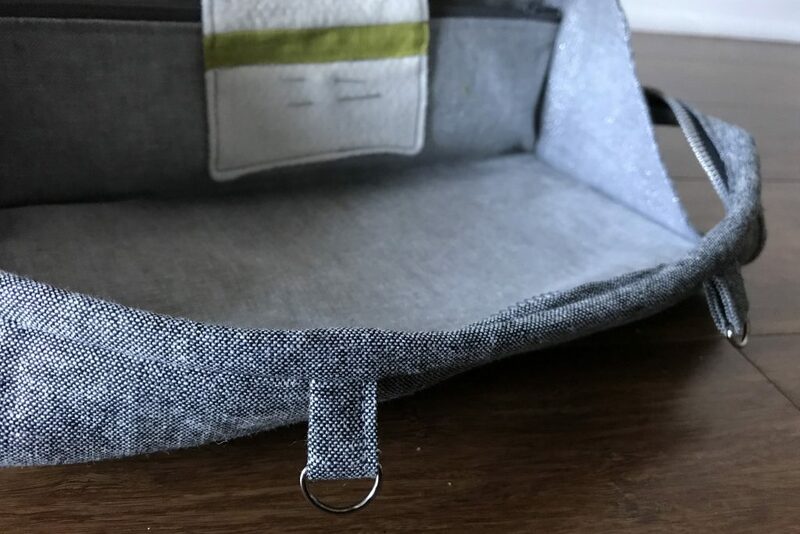 And I added the aforementioned d-rings to the binding that becomes the front of the tray, so that I can attach a small Open Wide Pouch (modified with swivel hooks attached and a cutting error that makes it deeper than it should be) that acts as a thread/scrap catcher. I also went pretty basic with fabric on this; there is no fussy cutting, printed patterns, or decoration to be found. All of the fabrics are Essex Linen Blends, mostly yarn dyed. 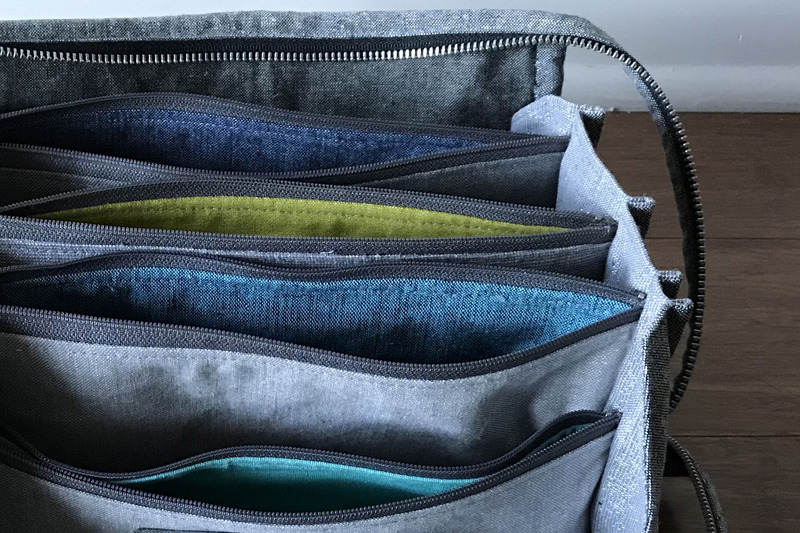 The interior is made of shades of gray; the zippered pouch interiors are the only pops of (solid) color. I did order a slightly fancy metal zipper for the exterior with an interesting zipper pull. 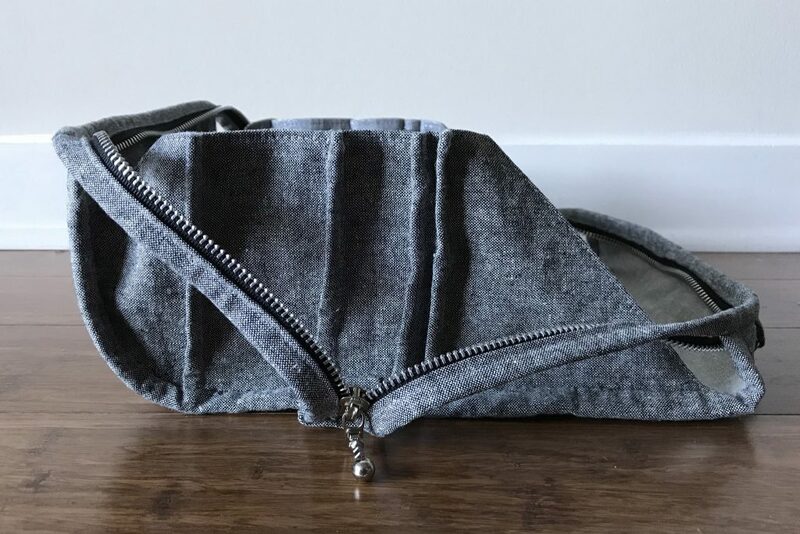 I love the overall minimalism of the bag and am looking forward to making a machine cover in the same fabrics. I can’t wait to travel with this. 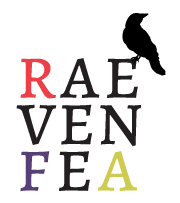 I’m signed up for a couple of classes locally and am heading back to VT for a few days later this month, conveniently at the same time as one of my guilds’ fall retreats, so I have ample occasions to use it. And it certainly fits a ton of stuff. 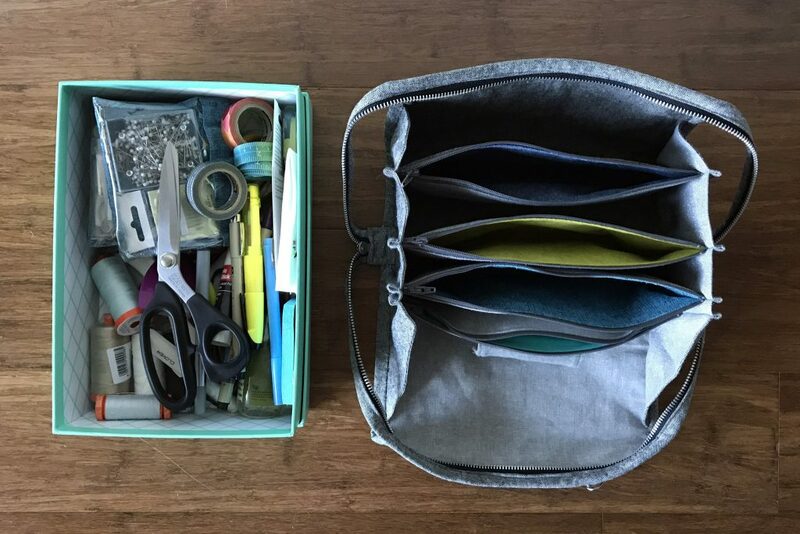 Almost everything I stuffed into this box when traveling to GA fit into the bag (or, in the case of zippers, became part of the bag)! 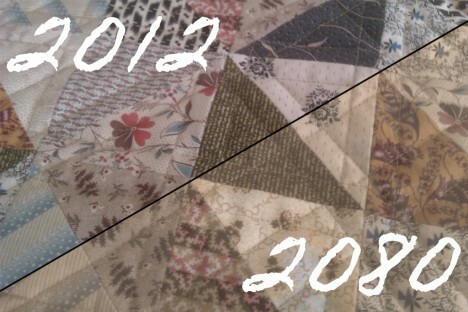 Leah Day posted about the chemicals we use in quilting a while ago, and how those may affect the life of our projects. The researcher in me was especially interested in a scientific study on adhesives used in quilting that she linked, which ran tests on the effect certain spray bastes, fusible webs, and fusible battings have on fabric over time. See, most of my life, I’ve despised sewing by hand. The thread tangles up into a ball of uselessness, it knots itself and pretty soon I just want to scream and run away. Not to mention my hand cramps up, I poke myself accidentally and I start getting needle indentations on the pads of my fingers. Often, when something ended up in my unfinished projects pile, it was because there’s just a little bit of hand sewing that needed doing and I couldn’t bring myself to do it. Well, ladies and gentlemen, let me introduce you to a wonderful new (where by “new” I mean “has been in use for this for hundreds of years but somehow nobody ever told me about it until now”) product called beeswax. If you drag your thread over the wax, it miraculously coats it just enough to keep it from tangling and knotting up, but not leaving any icky residue on your fabric and what not. So, while I’m not willing to say I like hand sewing (there’s still the issue of cramping and poking), I certainly no longer despise it. We’ve formed an amicable acquaintanceship. But, at least it no longer causes a ton of UFPs! You can pick it up in most quilting notions aisles in a neat little plastic holder with slots to drag the thread through. It’s quite possibly the cheapest, most vital notion for hand sewing after the needles and thread themselves. Frugal tip: before I scrounged up a Joann coupon (or maybe waited for a quilting notions sale, I don’t remember), I used a chunk of white soy-based wax from a candle I had lying around the house. It worked pretty well, although it’s a slight bit softer, thicker and more residue-y than the beeswax. But hey, work with what you’ve got, I say. 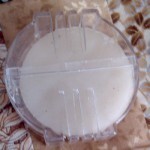 Any candle wax that is white or natural-colored should work okay in a pinch. Have you known about waxing thread for ages? What other tips do you have? Are you partial to a specific brand of wax?